A small soil sample contains clues about the diseases likely to affect crop yield and productivity. Microscopic organisms such as bacteria, fungus and nematodes hold the key to healthy, productive soil. SARDI scientists started developing new DNA-based technologies to identify these pathogens and to measure the risk they pose to crop health. We had to design and develop specialised equipment and methodologies to provide practical and science-based crop productivity solutions for Australian producers. 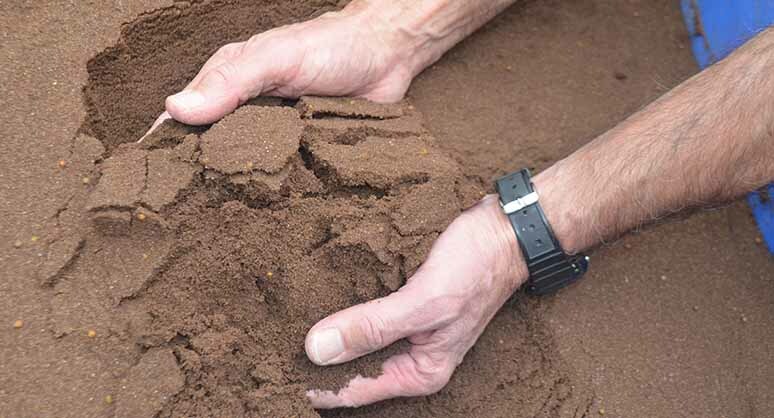 SARDI commercialised the service with the PreDicta suite of soil tests, for broadacre (tradename PreDicta B) and potato (PreDicta Pt) industries, to identify soil-borne pathogens which pose a significant risk for growers. Early detection of these disease risks can help farmers to make more informed management decisions such as fungicide seed dressings, crop rotations and modified sowing techniques to lower their risk of crop yield loss. More than 1,500 agronomists and consultants across Australia are accredited through SARDI’s annual Agronomist Root Disease Risk Management training courses to give advice on test results. Since the research began about 30 years ago, the range of diseases and micro-organisms which can be isolated has expanded to include soil seed banks for declared weeds, beneficial free-living nematodes as an indicator of soil health and tests for stubble-borne pathogens. The national Molecular Diagnostic Centre at SARDI’s Plant Research Centre at Waite Campus now delivers strategic support for the grains, horticulture and other primary industry sectors across Australia, along with export industries and researchers. The laboratory is accredited to receive international quarantine samples, with appropriate permits, and can process up to 250 samples a day. Uptake by researchers has increased from around 5,000 samples in 2002-03 to more than 31,000 in 2013-14. Development of rapid, reliable testing to monitor the impact of finfish (tuna and kingfish) aquaculture on the marine environment was the first example in the world of using DNA assays to support licensing regulations of aquatic systems. The new PreDicta Pt DNA-based testing for soil-borne disease services for the potato industry is helping to reduce crop losses of more than $80 million a year in potato production across Australia. The PreDicta won the 2014 John Deere Productivity Partner Award and 2013 Award for Research Excellence at the AUSVEG National Awards for Excellence. Testing also covers the fodder, grape and wine, other horticultural and aquaculture and fishing industries. The Molecular Diagnostic Centre is supported by the Grains Research and Development Corporation (GRDC), SA Grain Industry Trust, Horticulture Innovation Australia, CSIRO and Meat and Livestock Australia.